Ever wonder what it takes to pull off a large-scale installation? I just found out, thanks to the many people involved in bringing Grace’s Garden to life. 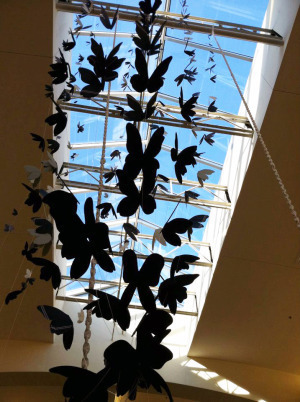 On behalf of microWave Project, an organization that matches artists with unique and public opportunities, Grace is now on exhibit in the entrance foyer of Huntington Mall. 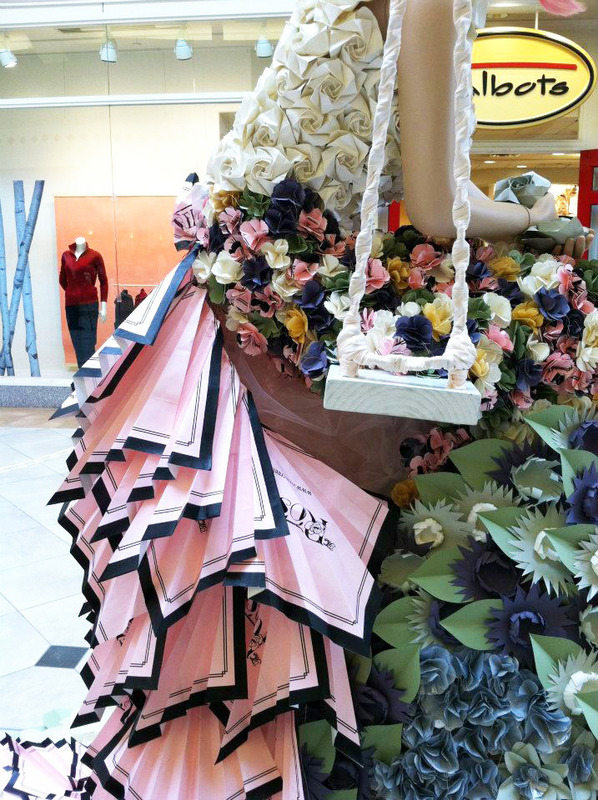 I was one of two artists invited to create a fashion-inspired installation in honor of the mall’s re-opening after a massive renovation and upgrade. 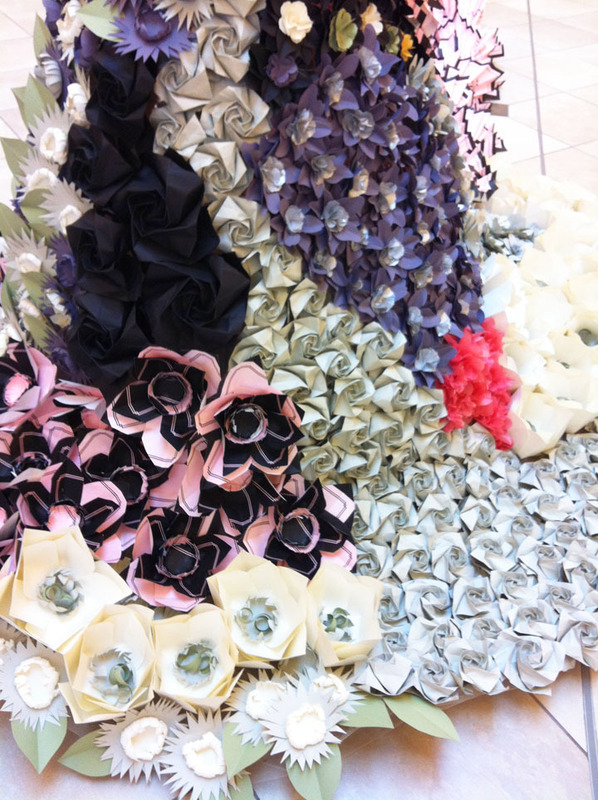 A Torpedo Factory colleague, Lisa Schumaier, created a seasonal installation of recycled materials, A Recycled Fairytale. 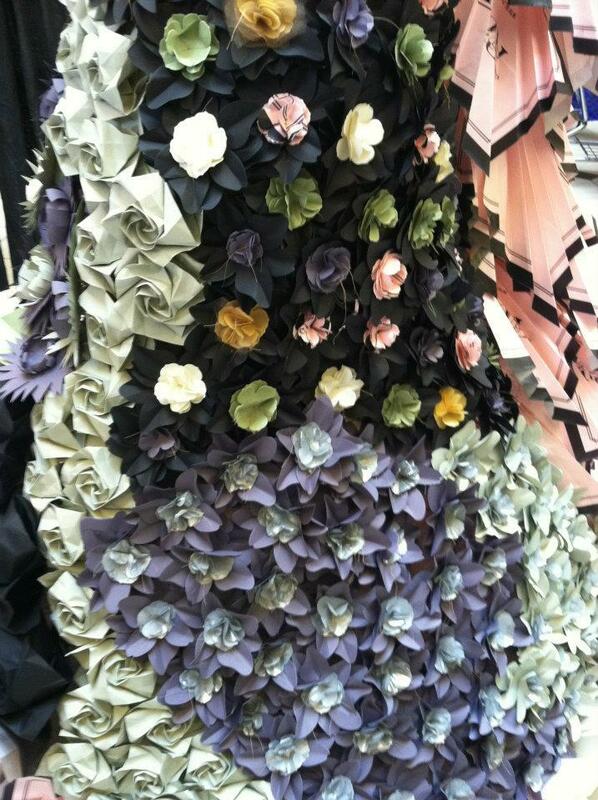 Grace consists of hundreds of hand-made, -sewn, and -folded paper flowers from fine art and tissue papers. 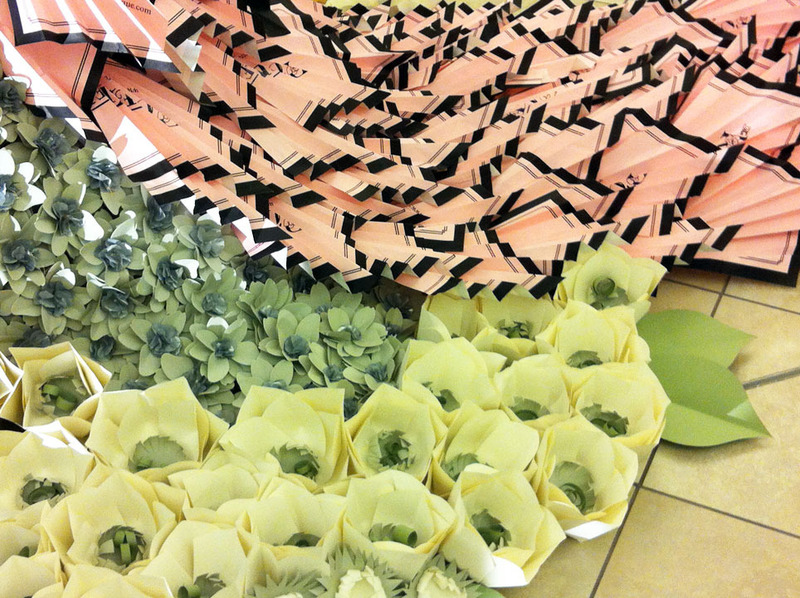 A local mall store, The RoseTree Boutique, contributed hundreds of paper shopping bags that were transformed into flowers and origami fans for Grace’s train. 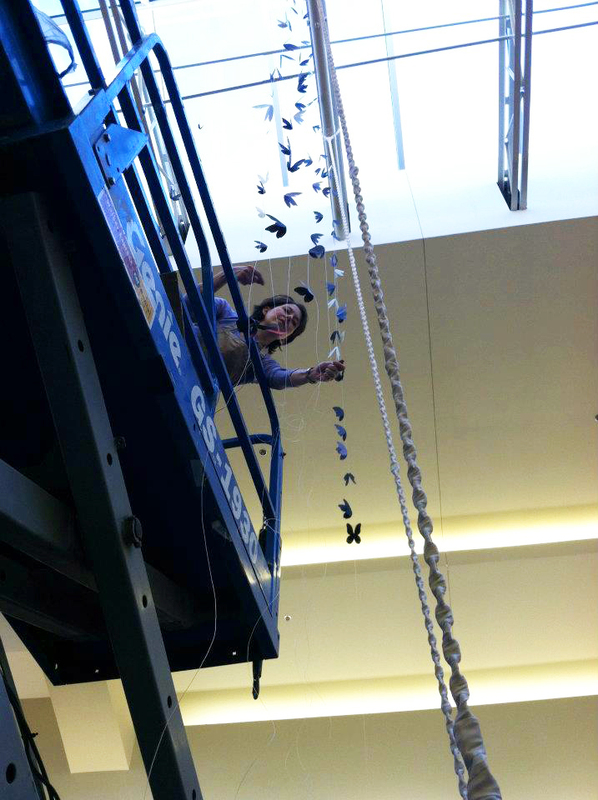 Hundreds of paper butterflies comprise her fascinator (hat) that “fly” up through the skylight in the 30-foot ceiling. Handmade paper flowers for "Grace's Garden" (image: Allison Nance)The elements for Grace’s gown, fascinator, and train were started months ago in my home studio in Germany. Most everything was pre-cut, flat-packed and shipped to the US. 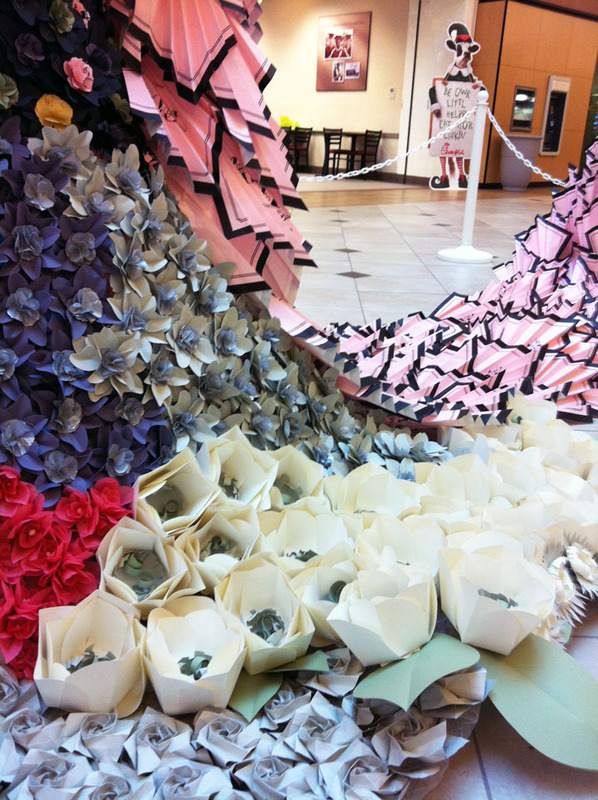 There, a virtual workshop of helpers hand-assembled flower petals, folded origami fans, and generally worked non-stop up to and through the four-day installation. We topped the whole thing off with a red carpet gala, featuring a dancing flash mob and celebrity appearances. The best part for me was sitting quietly to the side to watch people’s reactions to Grace. The best surprises were the grown men stopping to snap her picture (“My wife has to see this!”) and watching little kids react (“Look Mommy, butterflies!”). We even garnered a little media attention through the local newspaper and television news. A project like this does not happen in a vacuum. This was truly a family and friends affair. Moms, dads, husbands, sisters, nieces, a brother-in-law, and lifelong friends were up to their elbows in paper for days on end. 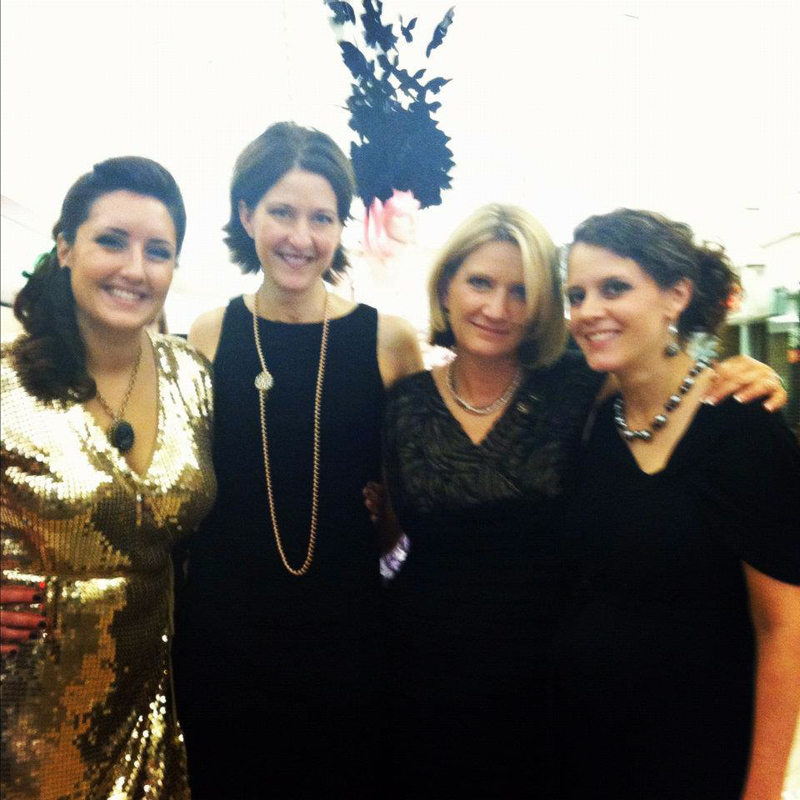 A very special thanks to my onsite installation team: Donna O’Brien, Mandy Gordon and Elizabeth Smiley. Not only did these three women put in some crazy hours with me, they each played crucial and unique roles throughout the process. Mandy Gordon and "Grace" with her eyelash-protection gear Donna O'Brien and Kelly O'Brien in front of "Grace's Garden"
Mary Cook, Elizabeth Smiley, and Mandy Gordon folding RoseTree Boutique shopping bags into origami fans for "Grace's" trainAlso onsite helping were Mary Cook, Allison Nance, Melanie Cox, Kelsey MacDuff, Eric Cook, and Kevin Nance. Behind-the-scenes flower-makers include: Katie Engen, Katelyn Engen, Brennah Engen, Eric Engen, Bill O’Brien, Rita Evans, and Lindsey MacDuff. The folks at Huntington Mall could not have been more friendly or helpful. They are: Joe Johnston, Property Manager; Margi MacDuff, Marketing Director; the facilities management team of Devin Holland, Alfonzo Samples and Chris Muncy; and RoseTree Manager Kate McMullen. The mall is owned by the Cafaro Company, with an equally awesome team: Leonard Bretcko, Director of Construction; Phil Boyd and Hank Picozzi of JJO Construction; Esther Buschau, Director of Corporate Marketing; and Mr. and Mrs. Cafaro themselves, who came out to help celebrate their mall's renaissance. Phil Boyd, Roger Pahoresky, and Kelly O'Brien hanging "Grace's" swingBehind it all was my husband, Ian. His support made all the difference, before and during the installation. When I got his 4 a.m. text on that final night, “You WILL finish!” I knew everything was going to be fine. The amount of work and generosity of spirit required to pull this off was, well…amazing. I’m humbled by what people were willing to contribute, thrilled to have the opportunity, and brimming with ideas on what I’d like to do next. 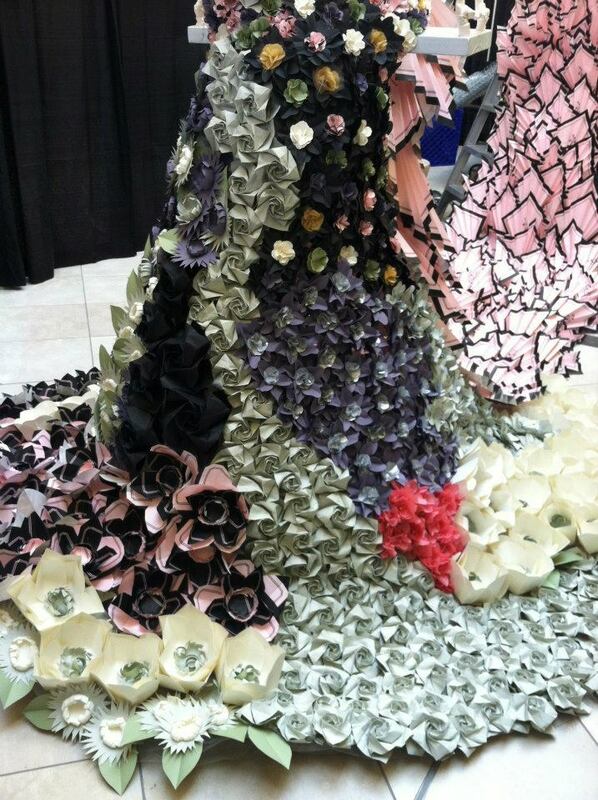 Grace’s Garden on exhibit at Huntington Mall, Barboursville, WV now through January 7, 2012.